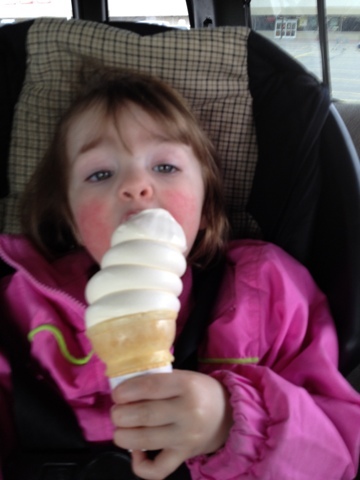 Third week of February the daycare kids were mostly too sick for daycare with combinations of fevers and runny noses. I did a lot of diffusing, Breathe the respiratory blend and Peppermint. I tried to get some work done with everyone in tow. 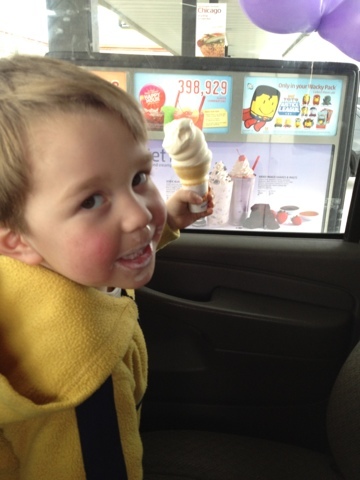 Not too effective, but we spent a fun noon time at the Sonic drive-in. Saturday was one of those days when everything starts to turn sour. It all started with an air soft bullet to William's right eye. An emphatic gun safety/why do we have these things anyway lecture to be heard by the whole neighborhood followed. And everything went down hill from there. Bad Mom. All I can do when I feel the world falling apart is force everyone to clean. I swear it makes things better. So by 9:00 pm we were all happy again and we piled in the van to get Panda Express. 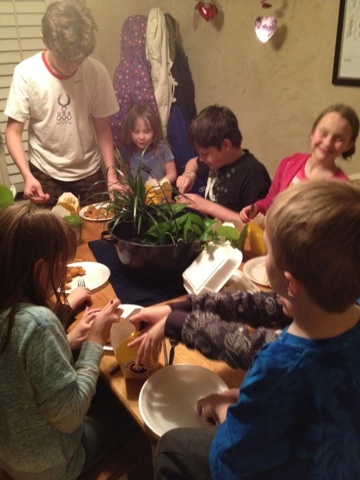 You can see us there huddled around the Orange Chicken. Sunday was the big night around here, the Oscars. I was elated when Meryl Streep won. Tree of life was our favorite but oh well. And what about Jude Law in Contagion? 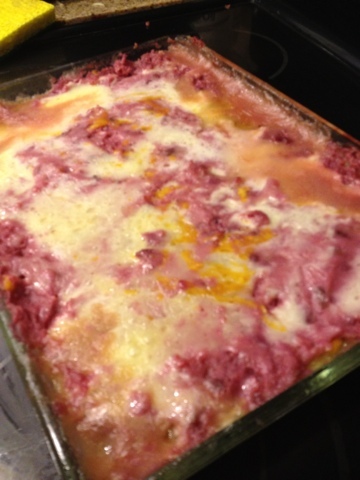 We made a delicious Purple Potato Shepherd's Pie with the beautiful Merlot Potatoes that Anne and Eric sent us from the San Luis Valley. As they say in Maine, I just scrambled a pound of hamburg, with a chopped onion. 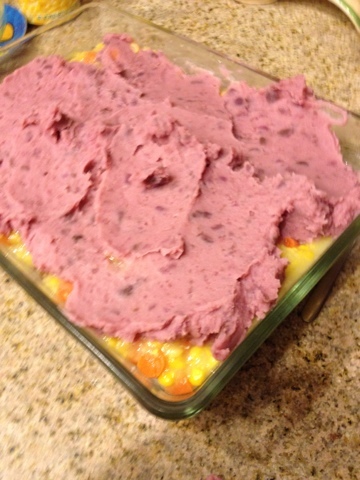 Added a bit of flour and milk to make a gravy, then topped that with a couple of chopped, microwaved carrots, two cans of creamed corn, and covered that with purple potatoes mashed with butter and milk. Topped it all with cheese. This was the dish that our friend from the LDS church, Augusta Ward, brought us when Bethany was born. 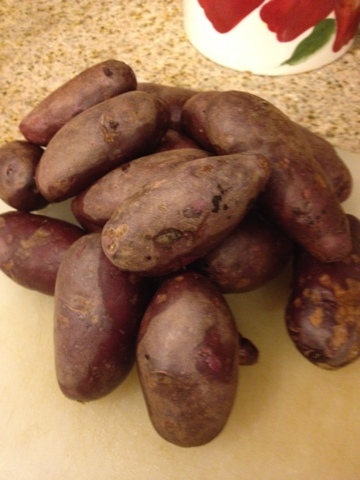 It is still her favorite meal and she loved it even more with purple potatoes.